Our plans are constantly evolving, but this is what we have in mind so far. We would love to have your input, so please do not hesitate to leave a comment below, or email us if you prefer. As with the avenues of Norway maple, not a lot will thrive around a mature avenue of common lime trees, so our best option here is to plant more spring flowers when there is very little other interest in this area. We have planted aconite corms under our limes for 2 seasons but the siccessrate has been very poor – back to the drawing board! and to add some perennial wildflowers to the south of that, creating a band of new planting between 2 and 4 meters deep. There will still be 3 gaps for walking through the hedgerow to the path on the north, allowing passage between the tennis courts and Holy Ghost Field. The Council has already begun work on this very long term project to introduce more deciduous trees and a few evergreens, with the planting of 3 limes, 4 beeches and 2 oaks at various points in the park. These are part of a general tree replacement programme, and have not been planted in isolation but as part of a comprehensive scheme to enrich the fauna of the park – with mixed native trees, flowering and berry-bearing bushes, and flowering plants. Over the next few years we will be adding smaller trees – the likes of rowan, hazel, birch, crab apple, service and hornbeam. 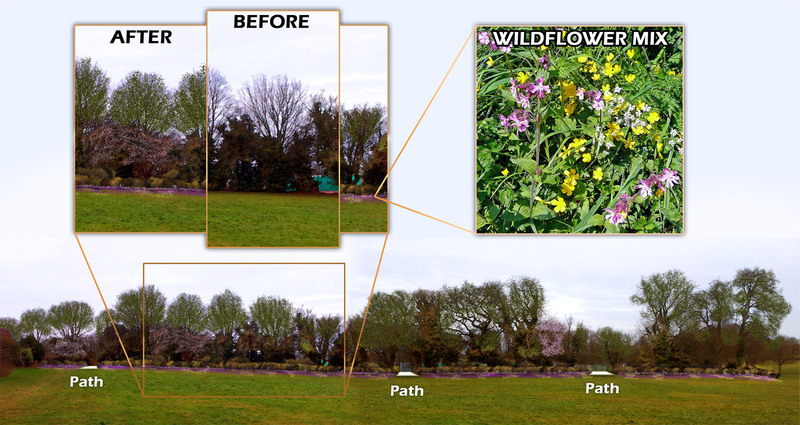 We will be experimenting with meadow flowers in small areas to see which non-grass plants can flourish without assistance. We’ll accomplish this either by introducing flower plugs or by leaving the grass uncut.